designed for Kiosk and Digital Signage on PC or Raspberry Pi. Linutop OS is small and can also be run on smaller configuration with less RAM allowing recycling of older PCs or raspberry Pi in order to extend their life cycle minimizing waste. Any type of bootable storage (USB hard drive or key, IDE or SCSI drive, SSD). Your BIOS should also be able to boot the desired hardware (configuration is hardware dependant). 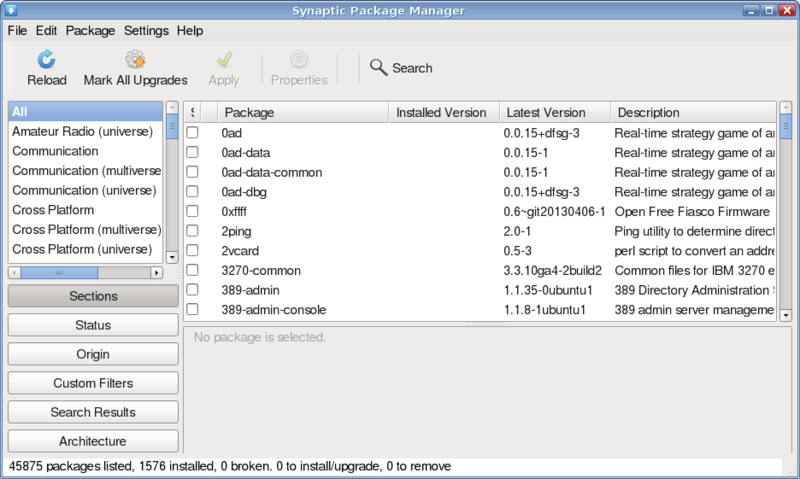 The system is based on Ubuntu 14.04, and has the same hardware compatibility. 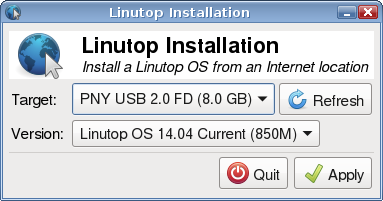 To make sure your hardware is compatible, download and run the Linutop OS Free. The system is based on Raspbian, and has the same hardware compatibility. 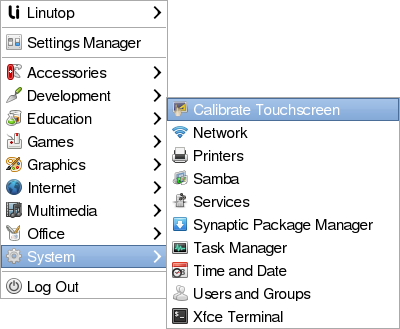 To make sure your hardware is compatible, download and run the Linutop OS XS Free. Linutop OS is already pre-installed on Linutop machine. Linutop OS can be purchased on USB Key or SD on Linutop shop. Linutop OS Free can be downloaded for free. (full version can be purchased on the Linutop shop) The Free Version has no limitation, only Linutop Kiosk and linutop Configuration Menu are in demo version most features can be used the full version is available on the shop and can be installed. This can be done from the Free system, following the installation documentation. Linutop OS Free can be downloaded on Linutop.com download page. 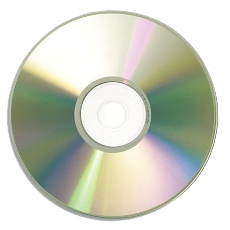 The ISO image needs to be burnt on a blank CD-ROM. To burn the image on Windows™, download InfraRecorder and install it. Insert a blank writable CD-ROM and start InfraRecorder. 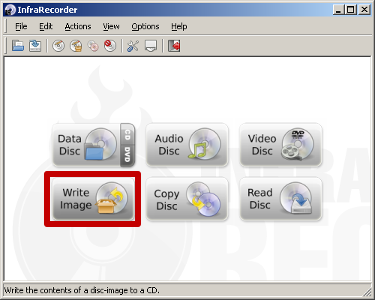 Click on the Write Image button, select the Linutop .iso file and click OK.
On Linux, tools such as Brasero, K3B or wodim can burn the ISO image on CD-ROM. Reboot your computer with the CD-ROM in the tray. The system will be run from your CDROM drive. Nothing will be written on your hard drive. 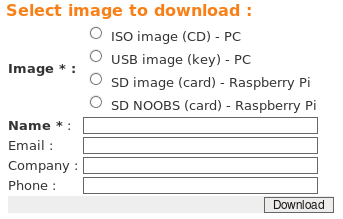 The USB or SD image needs to be written on a USB or SD device. On Windows™, download Disk Imager, uncompress it and execute the software. 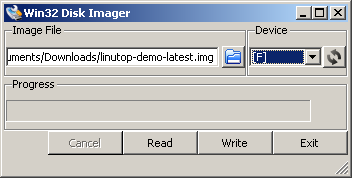 Plug in a USB key or an SD card (1GB min), select it and select the Linutop .img file. Click the Write button. Here is what should return this order. Once done, type the command below to transfer the file to the storage location. Replace X with the number returned by your device during the lsblk command. On Windows™ or Linux, Linutop OS XS NOOBS files can simply be copied on a FAT formatted SD card. - For the NOOBS simply copy the NOOBS files directly on the compute module storage and restart the screen. - For the SD image needs to be written on the compute module storage. Be carefull to select the correct device. You need to be connected to Internet in order to perform the installation. A new dialog will appear. Plug in a USB key or hard drive. The device will appear in the Target drop down list. Select it. The target device will be ENTIRELY ERASED, deleting all the data on it if you proceed to the next step. The system will be downloaded and intalled on the selected device. When the end dialog appears, it is safe to remove the device. The device can be used to boot on the same machine, or an other one. It is highly recommended to backup the Linutop OS before you start tweaking it. The entire system can be duplicated on a USB key (1G minimum). Plug in the USB device on which you want to perform the backup. If several devices are connected, choose the correct one from the Target drop box. 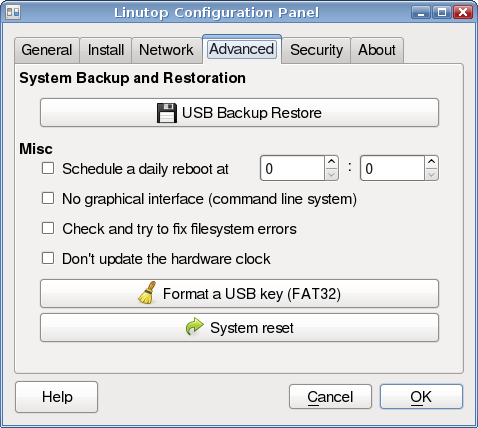 You can choose to backup the system only, as provided by Linutop. It is recommended to have one such backup. The other choice is to backup the system and the modifications you've done on it (added applications, configurations...). Make sure that your data and the system can fit on the USB device. Click the Apply. When the copy is done it is safe to remove the USB device. Boot on your backup key. 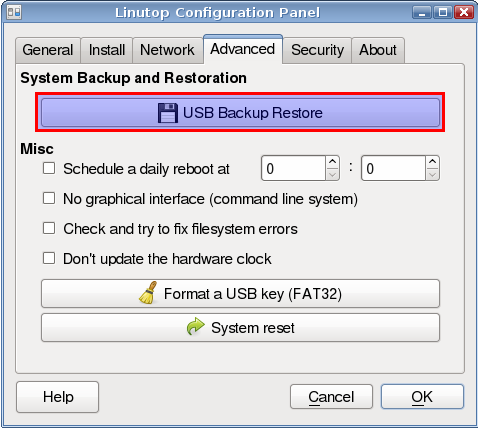 Start the Linutop Backup & Restore tool. 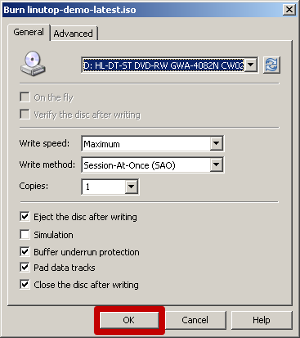 Choose the internal disk as target. 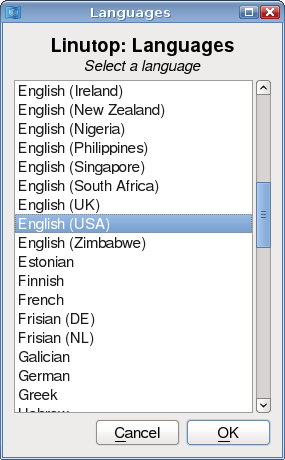 Select the copy type (system only or all data). Shut down, remove the backup key and restart. If you really want to reset your system to the original configuration, click on the Yes button. You'll have a last chance to cancel the operation. After the reboot, a simple menu with three choices will appear. Select what you want to do with the up and down arrow keys. Validate with the Enter key. Do nothing, and restart the system. Only the installed/suppressed software will be wiped out. Suppress all modifications (including data that might have been added on the system. The last two choices will DELETE various elements from the system. Make sure that's what you want to do before validating. If a password is requested, you must use the one of your current user. gksudo can be used instead of sudo to graphically ask for the user password. On Linutop OS for PC, the linutop user default password is blank. On Linutop OS XS (Raspberry Pi) the pi user default password is raspberry. 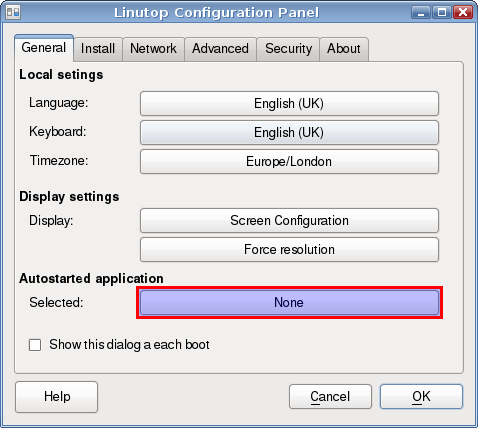 When booting the Linutop OS for the first time, the Linutop Configuration Panel will be started on the desktop. 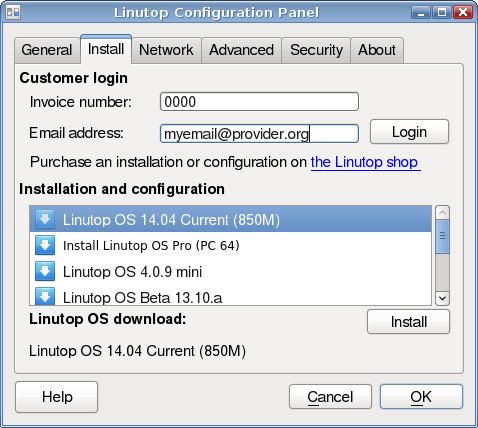 This application lets you configure the essential features of the Linutop OS. Clicking on each button will start a new dialog, allowing the make your choice. 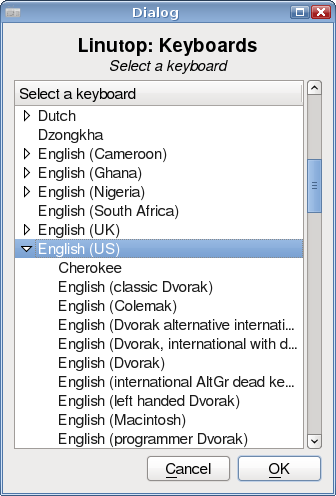 Note: Modifying the language first will update the keyboard layout and timezone as well. Time and Date are automatically synchronized by a NTP Server on the Internet. If the system is offline, it will use the local battery backup internal clock. 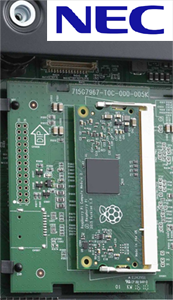 On Raspberry Pi there is no internal backup clock, it has to be synchronized on the network with an Internet NTP server or a local NTP Server or manually. To manually setup the clock you can use the Date command line in a terminal. sudo date --set "14 Feb 2019 18:30:00"
By default the Linutop OS will detect the screen resolution automatically. If you need to set a specific resolution, click the Screen configuration button. 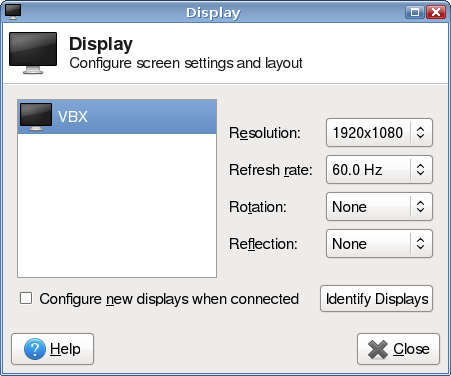 A new dialog will open, allowing to select a resolution. 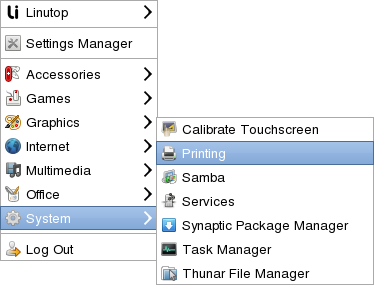 Linutop display configuration menu has been designed specificaly for Raspberry Pi with most important graphics settings features in one menu. Note: Some resolutions or videos might require more GPU memory to work properly. 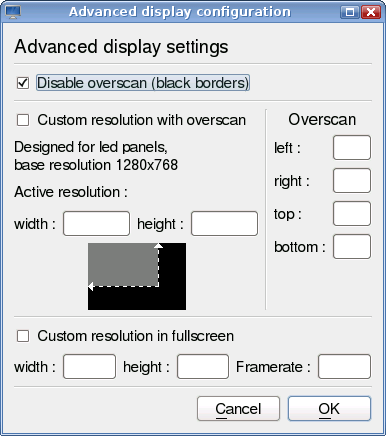 Screen resolution, orientation and overscan can be easily set up . Linutop advance display settings menu has been designed to accommodate many custom settings including Led panels configuration on Raspberry Pi. A right click on the icon will let you configure the connection. A left click on the icon will show a list of available devices. If you have WiFi hardware, discovered networks will appear. Click on the one you want to use, and the connection will be enabled. If needed, a passphrase will be prompted. 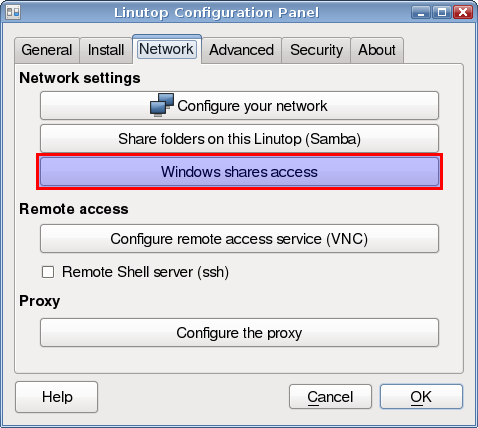 The Linutop OS can be accessed remotely if it is connected to a network. The remote access is disabled by default. 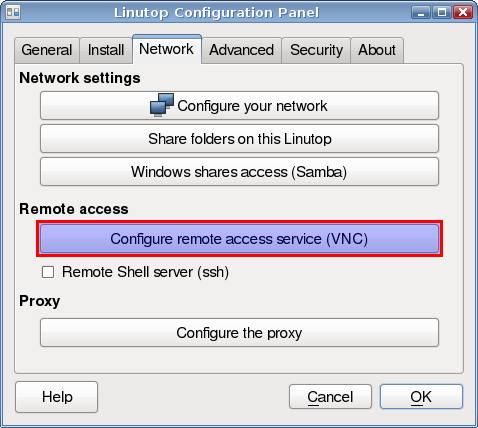 To enable it, open the Linutop Configuration Panel, go to the Network tab, and click the Configure the remote access service button. It is highly recommended to request a password for remote access, by checking the corresponding box. The buttons on the right column will let you manage the remote access service without rebooting the system. Click on the Quit button when you are done. 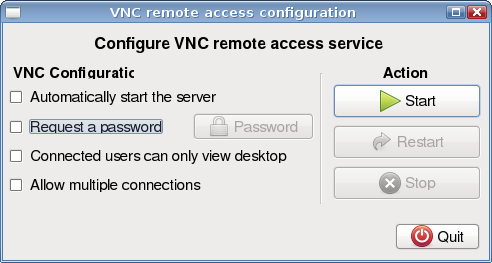 The remote access uses the VNC protocol. A new window will open, displaying the content of the Linutop OS desktop. 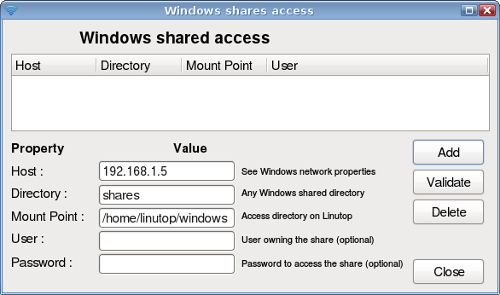 Access to Windows™ shared folders can be done in several ways. Open your home directory by double clicking the Documents desktop icon. On the panel, select Network menu. You can install the Gigolo from the package manager to access various types of servers (FTP, SSH, WebDAV, ...). 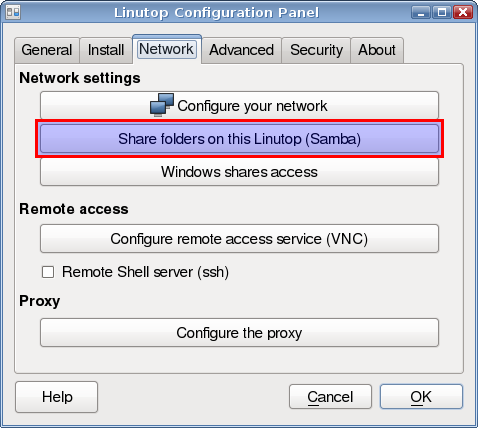 The Samba allows to share folders from your Linutop system. 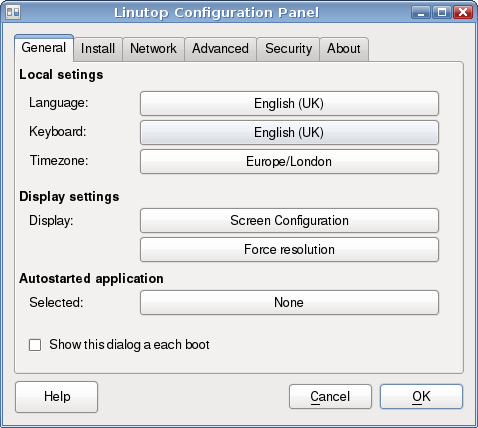 It is installed by default and you can configure it from the Linutop configuration pannel. 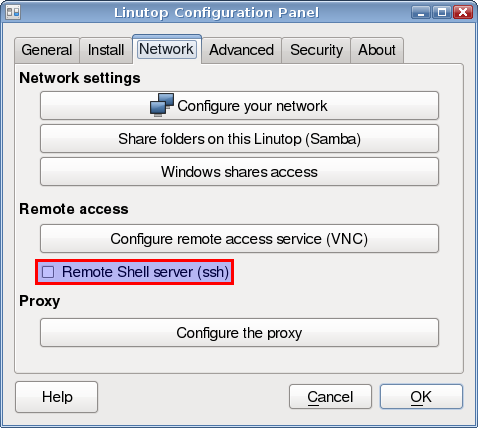 The SSH allows to access remotely to your computer with a terminal. You can start the ssh server via the configuration panel. 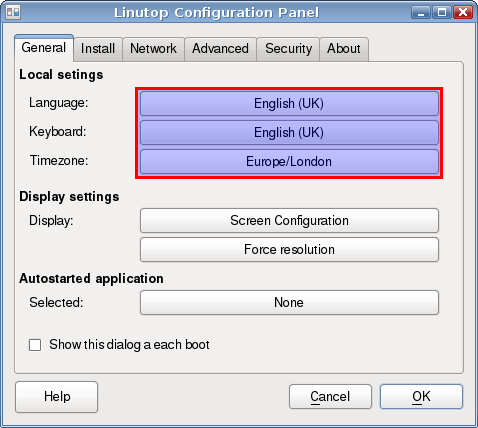 On PC Linutop OS can be configured in fixed IP with the file /etc/network/interfaces. Raspberry Pi Linutop OS peut être aussi configuré en IP fixe par Wifi ou Ethernet. 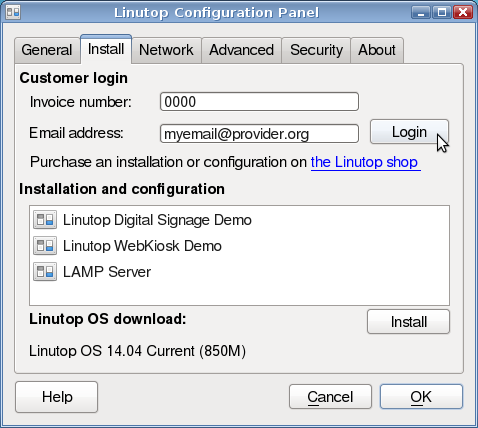 Raspberry Pi Linutop OS can also be configured in fixed IP by Wifi or Ethernet. 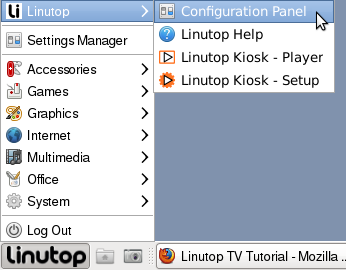 The Advanced tab of the Linutop Configuration Panel lets you configure some less used features. System Backup & Restore: see details. Restart the system every day at the configured hour. This helps cleaning the system memory, and restart in ideal conditions. For a server use, you might want to disable the graphical interface on the Linutop. To re-enable the graphical interface, use the startx command from the console when logged in. 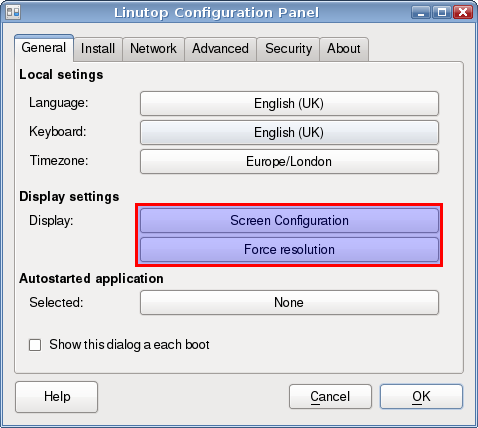 Uncheck this setting in the Linutop Configuration Panel to automatically restart the graphical interface during boot. To log in, use the linutop user name. The password is blank by default. The system checks that the file Ssystem is in good shape when it boots. This is a safety that shouldn't be disabled, but this option lets you decide otherwise. If enabled, the system will not change the hardware clock setting on shutdown. It is recommended to use it on a dual boot system (Windows/Linutop OS). This option will format a USB to make it usable under Windows™. 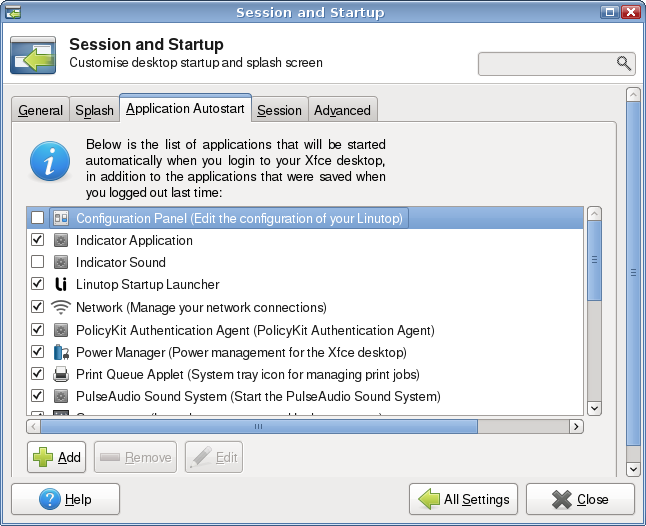 The Linutop OS comes with a set of installed applications. All these applications (in fact, the entire system) are open source. The Linutop OS XS is slighly different to accomodate the Raspberri Pi Platform. This application will automaticaly start an application just after boot, if the application unexpectedly stops, it will be automaticaly restarted. The drop down menu on the top on the window will let you select the application you want to start. 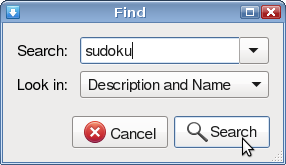 For each application, a specific menu will be displayed on the bottom part of the window. 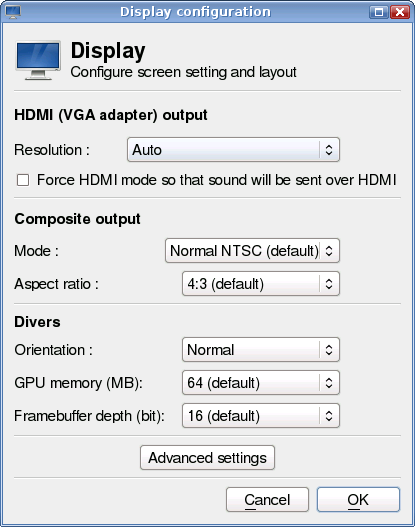 This option will forbid the screen saver to start (handy for digital signage applications). If no mouse movement is detected, the mouse pointer will disappear after a second. Note: The flashplayer will automaticaly switch to fullscreen mode after a few seconds. To test your settings, click the Run a test button. Validate your choice by clicking the OK button. 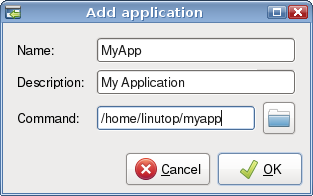 The newly selected application will appear in the Linutop Configuration Panel. More applications can be automatically started, using the desktop session mechanism. To set this up, select in the main menu : Settings Manager. In the settings menu, select the Session and Startup Item, then the Application Autostart tab. Click the Add button to add a new application to autostart. 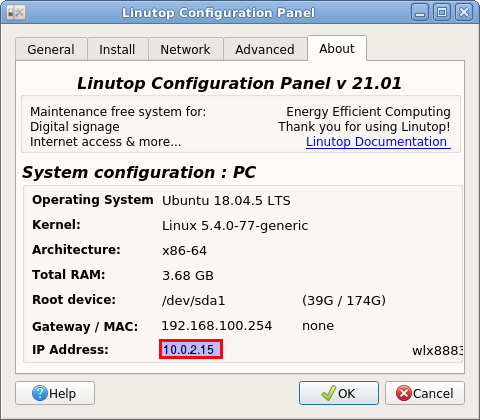 The Linutop OS is based on Ubuntu, a Linux operating system. Ubuntu provides access to a software library containing around 40.000 packages. 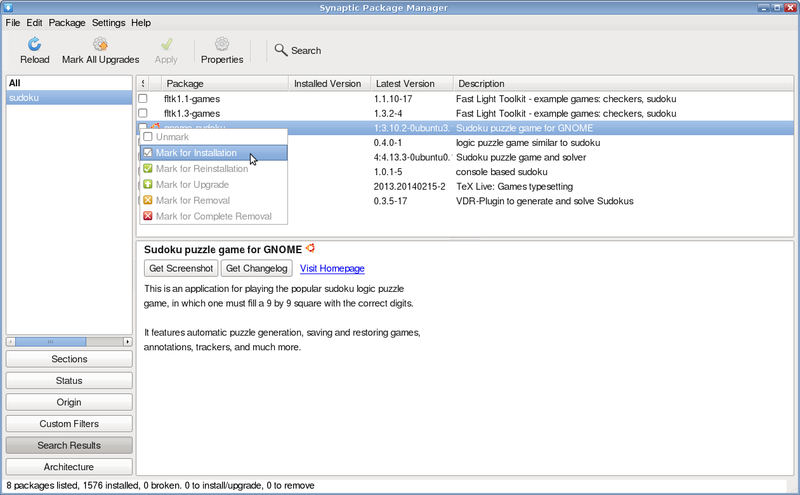 All these packages contain applications or tools, and can be easily downloaded and installed. All you need is an Internet connection. Click the Reload button to refresh the informations about the packages. 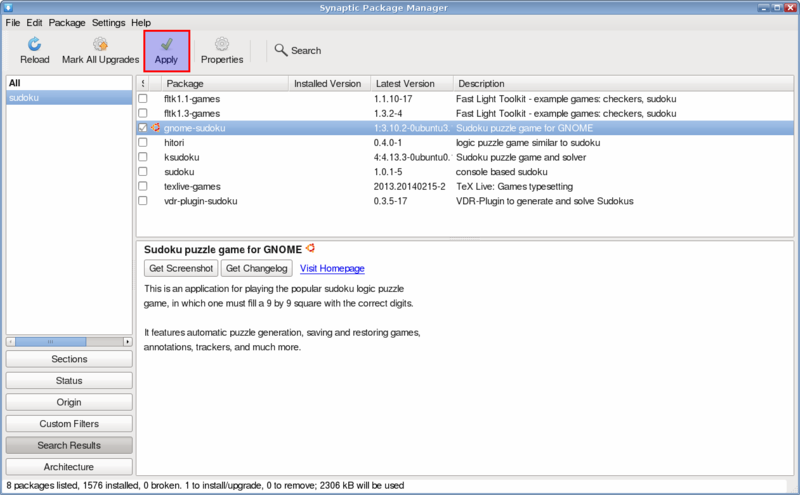 Reproduce the previous step for all the packages you want to install. To keep the installed packages after a reboot, make sure to be in persistent mode. You can use the tab key for autocompletion. The Linutop OS offers a security system bound to its internal architecture. It uses the concept of LiveCD, but makes it more flexible. The system is contained in a single file that can't be modified. No matter what happens on the system, you'll always be able to restore the original state of the system using this file. By default the Linutop OS behaves like any system. Anything you do is written on disk and will still be there after a reboot. Administration tasks will require a master password. Switching the system in Lock mode will make all new changes temporary. After having configured the system to your needs, switching to this mode will allow to discard all new changes on reboot. You'll always find the same start at startup. 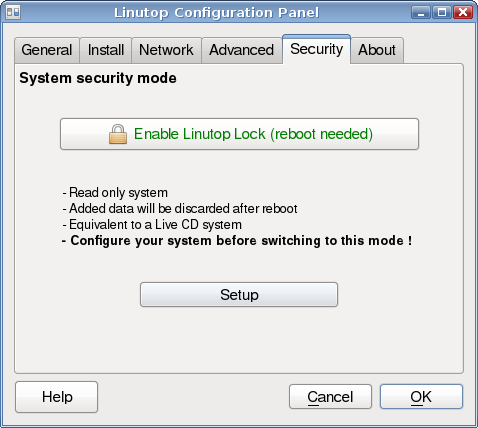 The choice of the security level can be done in the Linutop Configuration Panel, Security tab. Check the Linutop Lock box to enable high security. 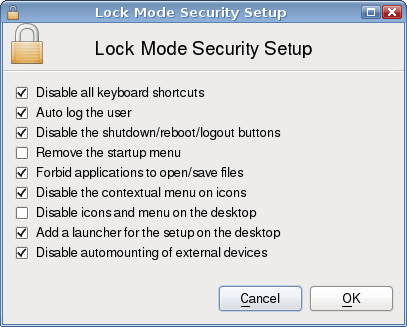 To switch back to normal mode, you'll have to execute the Linutop Configuration Panel and uncheck the Linutop Lock in the Security tab. If you've disable the startup menu and the desktop icons, you can use the Ctrl+Alt+s shortcut. The password you've defined when you switched to lock mode will be asked to start the application. Don't forget this password! 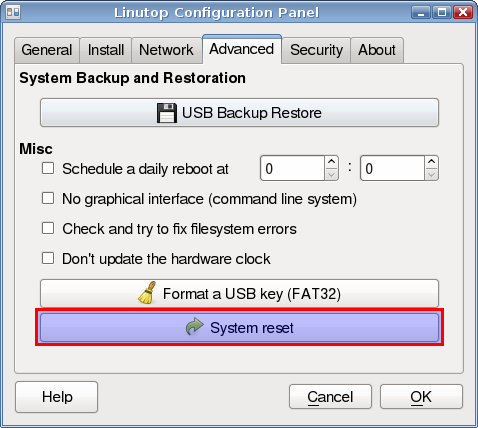 To halt or reboot the system in lock mode, start the Linutop Configuration Panel and go to the Tools tab. This tool will ask you to touch four points on the screen and will change the settings dynamically. Settings will be reloaded at each boot. 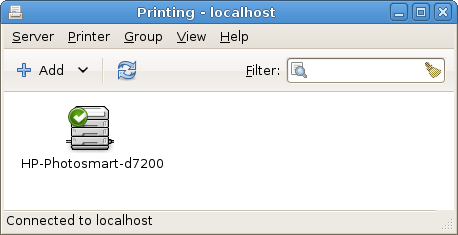 Click the Add button to configure a new printer. 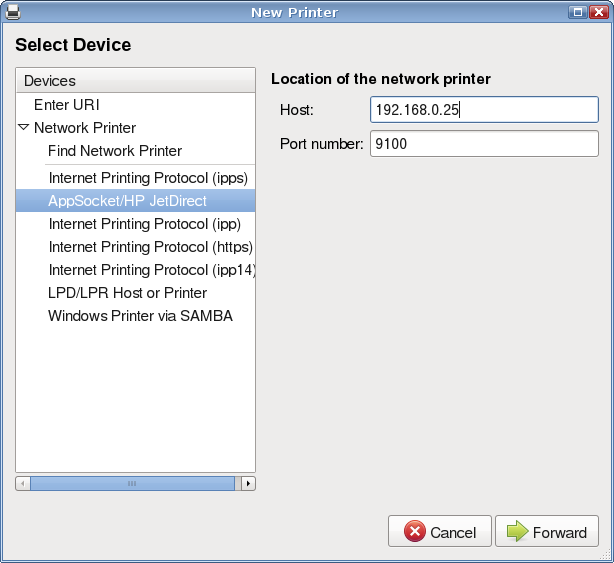 The system will try to autodetect connected printers. Can I disable the screen saver? Yes, in the main menu, select System Preferences Screensaver. Change the Mode to Disable Screen Saver. For PC: Select the BOOT device in the BIOS. Be sure to use the Proper OS, 32bits or 64bits. For Raspberry Pi:If the Raspberry Pi hardware is a newer version you may try the .img rather than NOOBS or update the firmware prior to boot. Use the print screen key to take a snapshot of the whole screen, and alt+print screen to take a snapshot of the active window. I'm prompted a login and a password, what should I use? The login is linutop and the password is blank (unless you've activated the lock mode). I want a fancy desktop with lots of effects. Is it possible? You can enable compiz (if the hardware supports it) in the last tab of the appearance setup tool (System Preferences Appearance). By default thunar can access your network. to secure/prevent this network access for a public kiosk, use the command below. You need to restart your computer in order to apply the change. 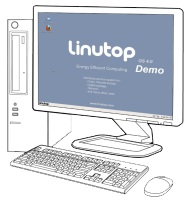 The Linutop OS provides tools to run Terminal Services sessions. This can be done by using either Terminal Server Client (Internet menu), a graphical application, or by using rdesktop. This will connect to the TS server 192.168.1.1, display le login screen in fullscreen, and use a french keyboard to transmit key events. To use the client, start Terminal Server Client (Internet menu), and select ICA as Protocol.